Will this be the final finish for 2014? Today I have a finished project to share with you. Some of you may remember this gorgeous parcel of woolly goodness that arrived here for my birthday last February. I chose ten of the brightest colours I could find and also added some black. 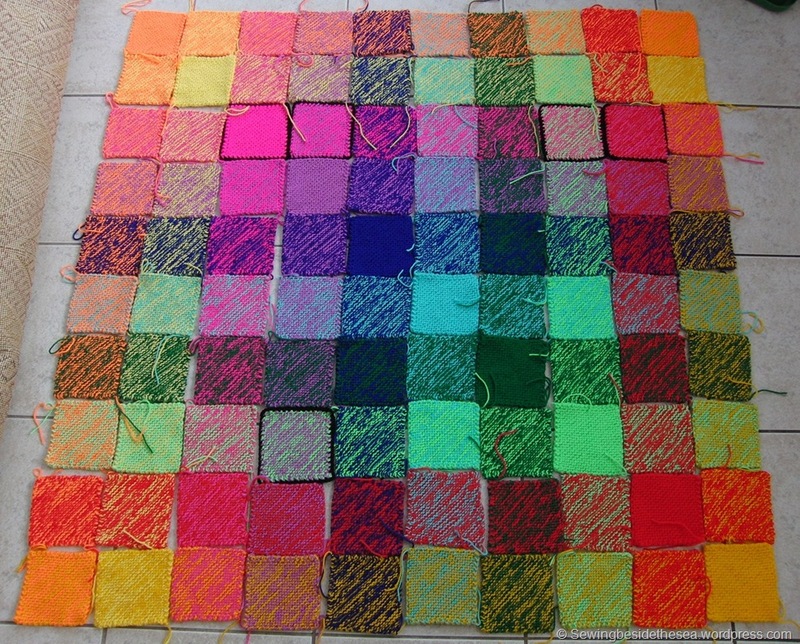 Then it was time to find a pattern. 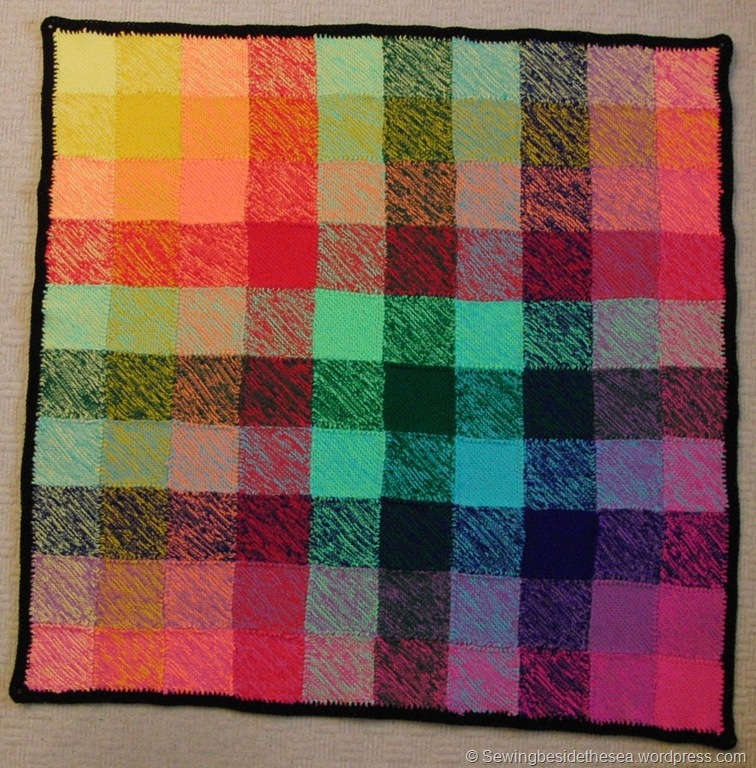 I chose this one called Double Vision by Woolly Thoughts because it reminded me of stained glass. 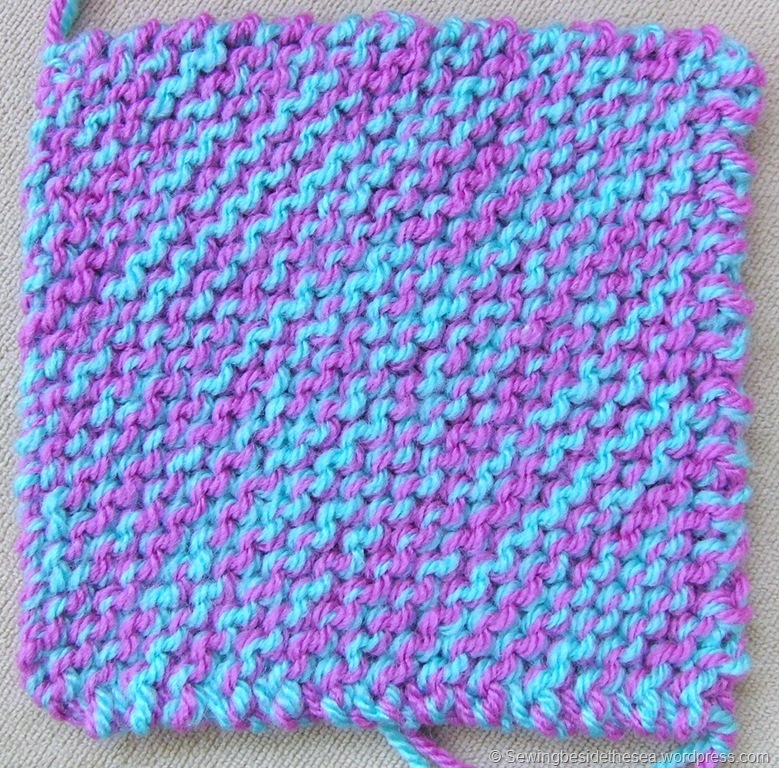 I knitted up the 100 squares really quickly. 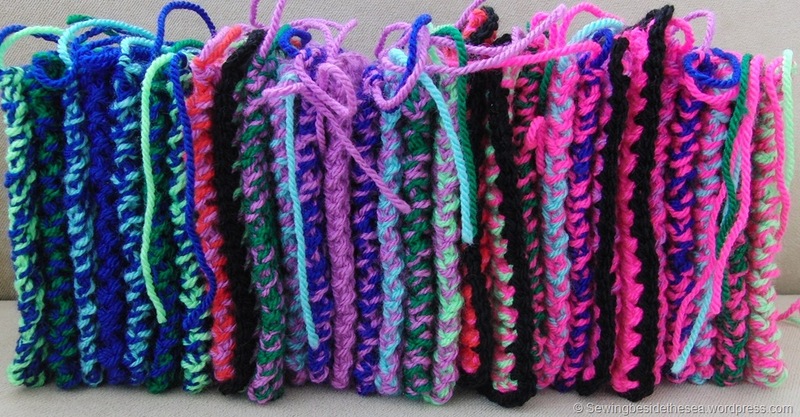 In fact, for a time I thought I was addicted to knitting these little gems. 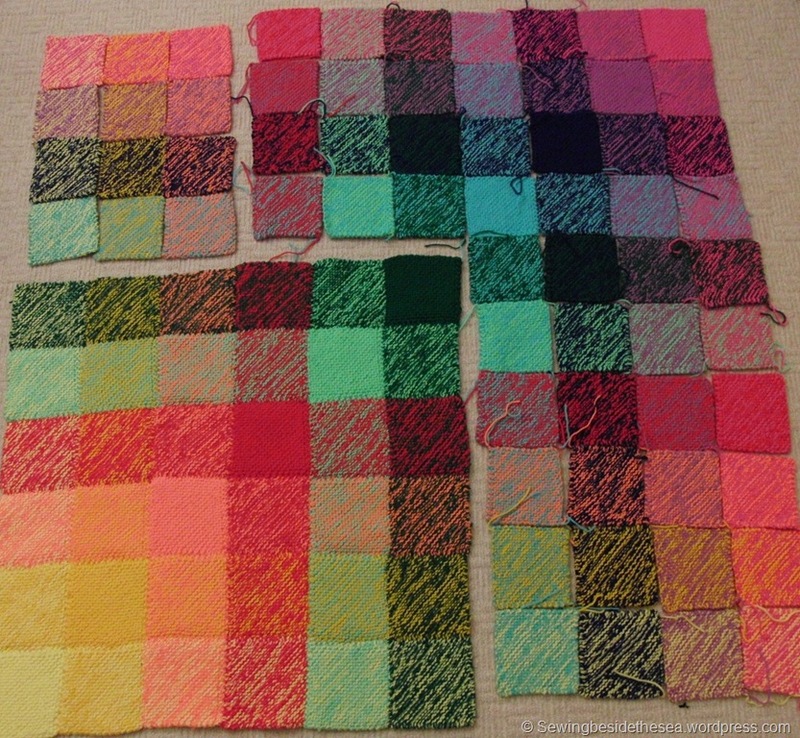 I decided not to knit the pattern as instructed (nothing new there then) and to make all of my squares on the diagonal. After finishing I tried edging with black crochet but wasn’t happy with the irregular finish, particularly as the squares had turned out so perfect. So, it was back to the drawing board which usually means “Stuff it into a cupboard and think for a few months”. Anyway, with the weather turning really cold here over recent weeks I had decided that when I had time I would drag the bag from the cupboard and go for a finish. That was last week. 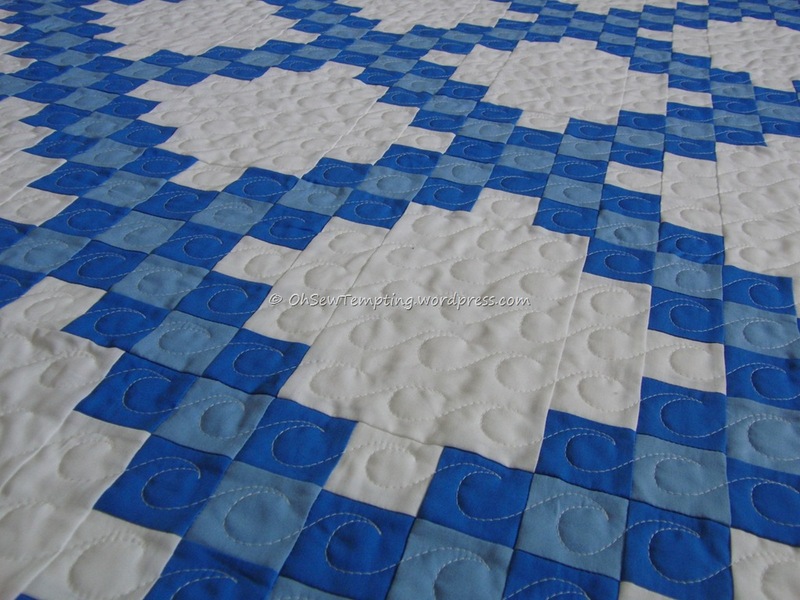 I knew I would soon have a few days without work so I looked for a good way to sew the squares together in preparation for the sewing together marathon. 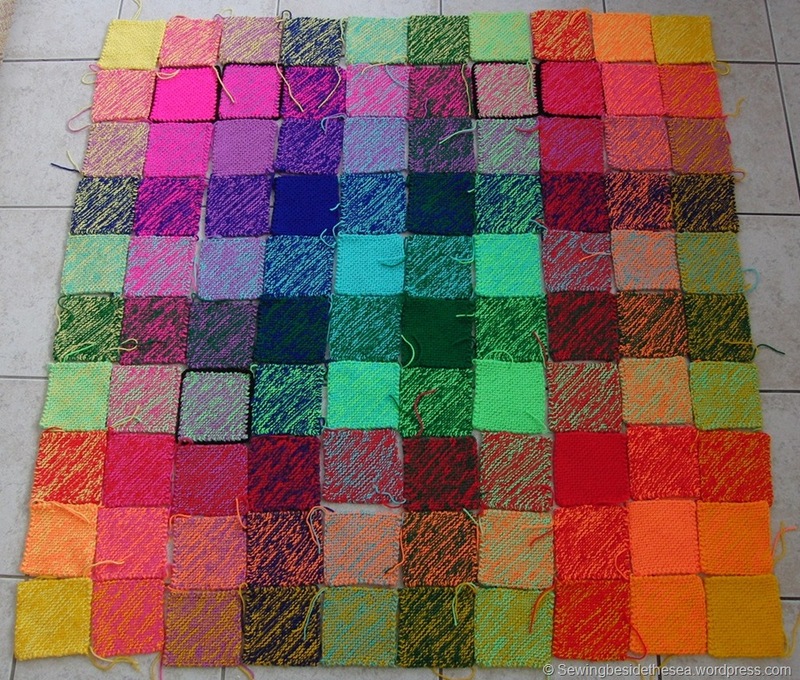 I completely abandoned the idea of each square having a black outline. 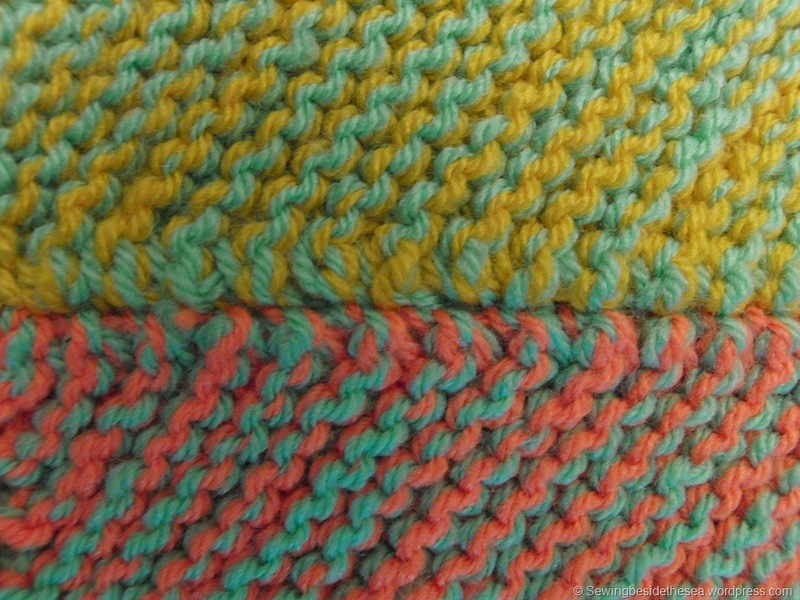 I found a video for the invisible stitching together of garter stitch knitting here. I think it worked really well. Here is a close up. Can you see the stitches? Finally, I crocheted a double border around the edge, again with two strands of yarn, and it finished it all off a treat. It’s so heavy that it’s all stretching as it hangs LOL. 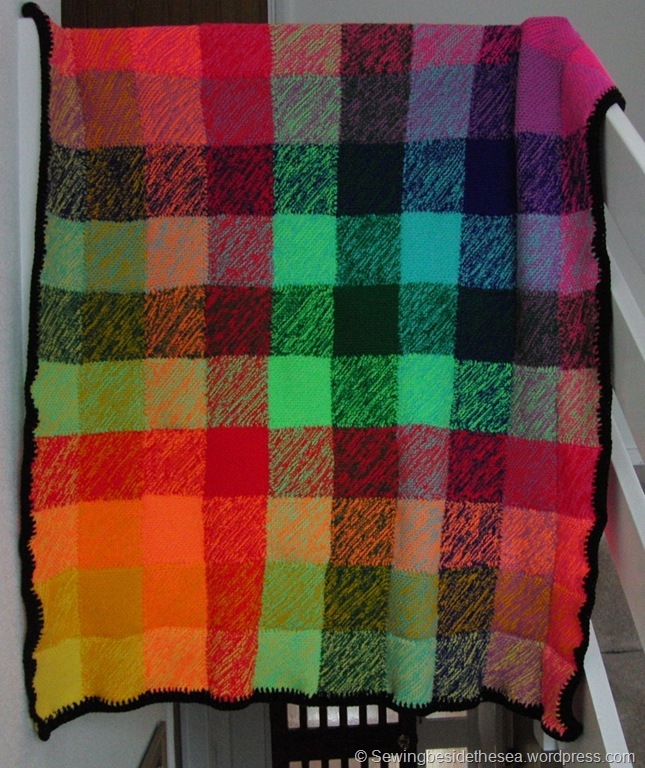 The finished size is 50 inches square and it’s really chunky and warm, perfect for those winter evenings on the sofa. I really enjoyed making this blanket and I’m very happy with the finish. 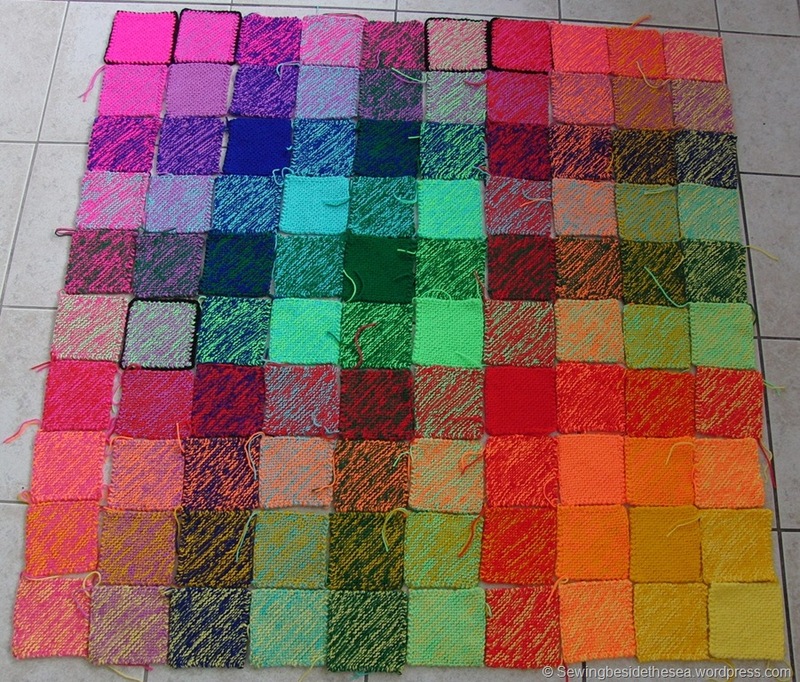 If I was to make it again, I’d definitely sew the squares together as I knitted them. 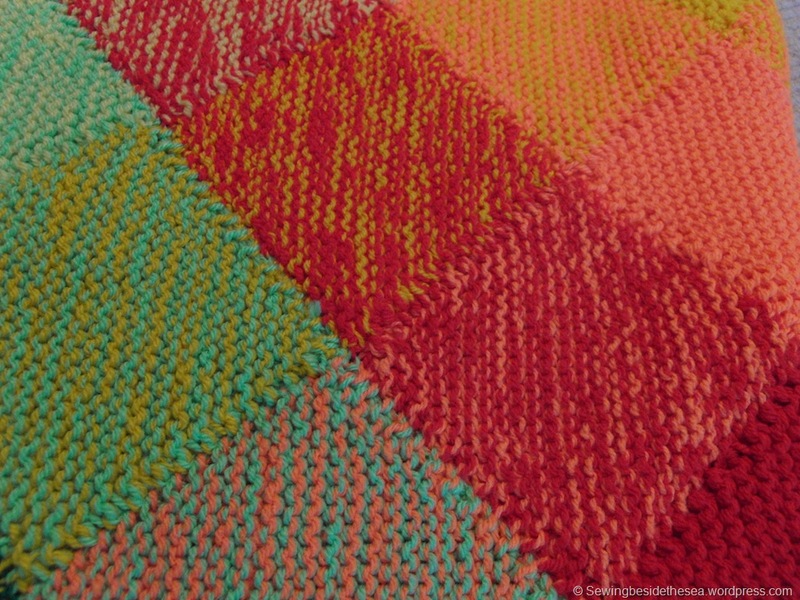 The pattern suggests a method of picking up stiches and joining as you go but I didn’t want a ridge on the back of the blanket. Mine is fully reversible and that’s what I’d hoped to achieve. I wish you all a very Happy Christmas and hope to see you again in the New Year . I thought you might like to see the latest project I’ve embarked upon. 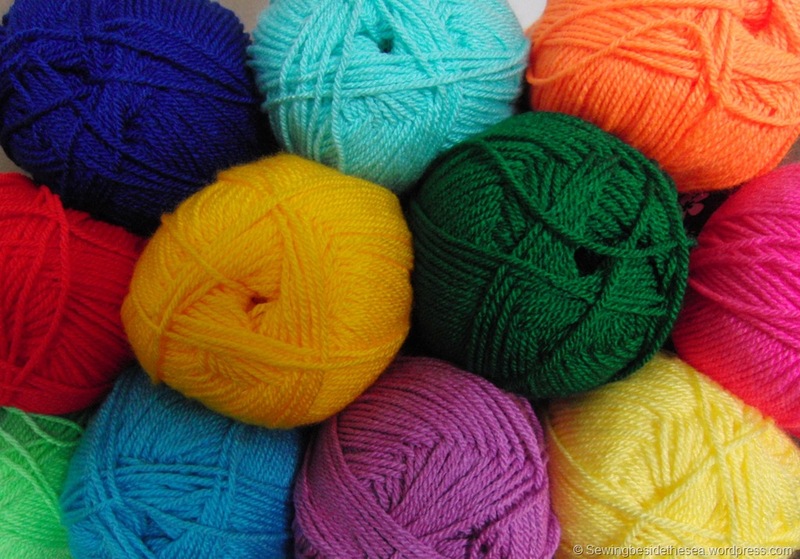 It involves these little beauties plus black….except the turquoise one at the bottom left. This yarn was a birthday present from my other half way back in February and I’ve been mulling over what to do with it since then. 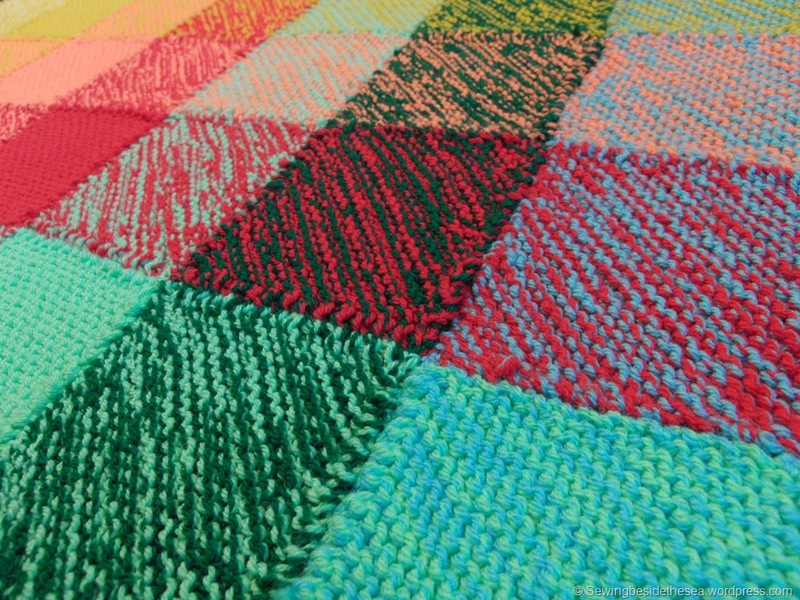 It was going to be another ripple blanket like my other one, then it was going to be a crocheted Klimt style blanket inspired by these but then I saw this one…..and I was bowled over…..completely head over heels! I can never resist making changes to patterns (annoying isn’t it?) but there is method in my madness. 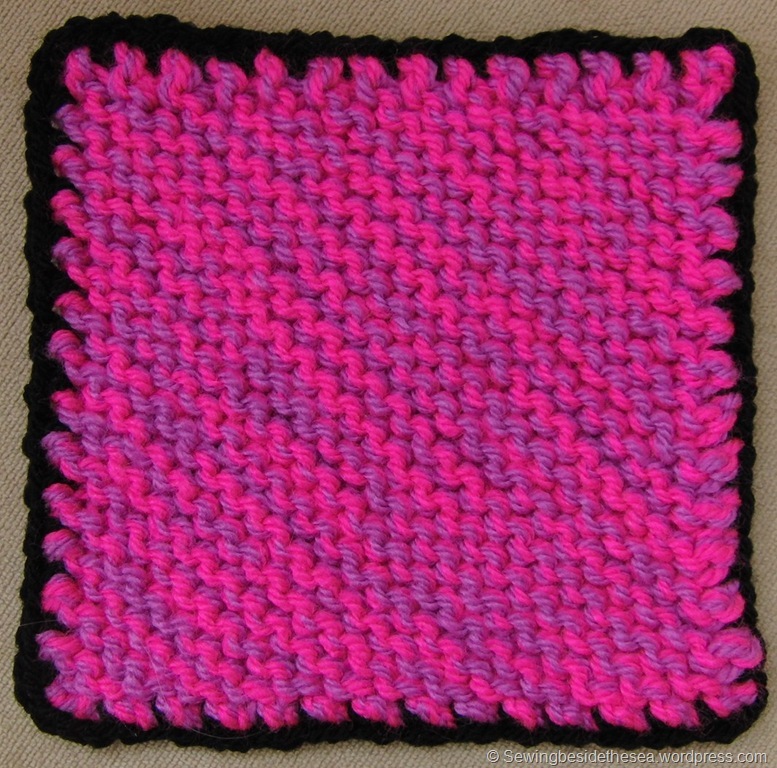 I’ve decided to knit all of my squares on the diagonal and not to make the black borders by picking up along the edge and knitting as suggested by the pattern. 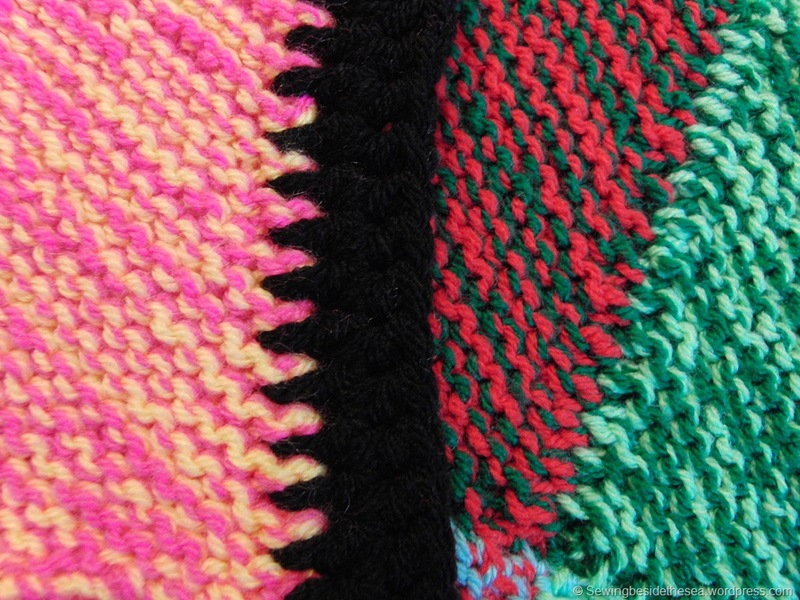 My stitches were uneven and I didn’t like the ridge that formed on the reverse of the finished squares after picking up stitches. I also thought that the back wasn’t looking as tidy as I wanted. I like the back of a project to look as good as the front if at all possible. So, I tried a few crochet stitches, with and without chains, one strand of yarn or two, and came up with this method which is the best of a bunch for me. I know it’ll take ages to crochet all of the borders but it doesn’t take any brain power so I’ll be able to add the black as and when I wish during spare moments. This is part of the pink set I’ve completed so far. 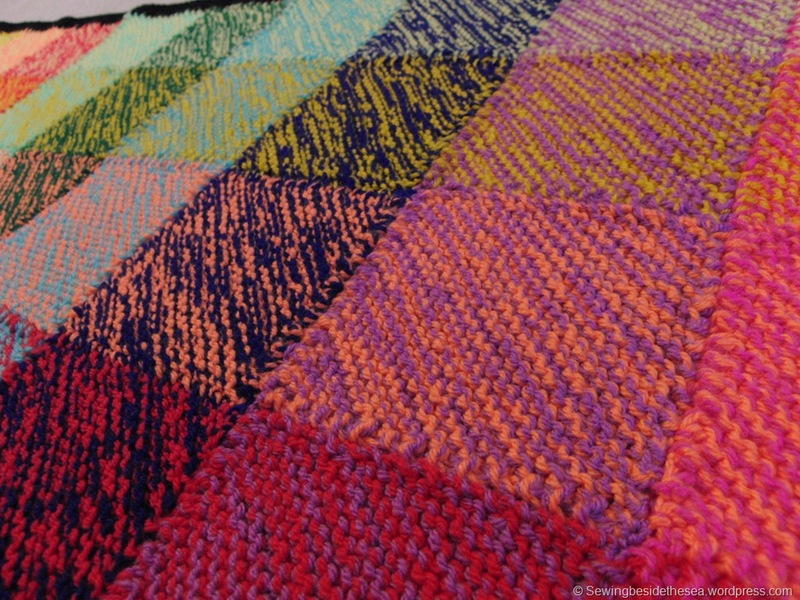 The pattern is very yarn hungry as it is knitted with two strands at the same time but the squares are lovely and thick and it is going to make a super chunky heavy blanket. I need to buy more yarn to finish the sets but so far I’m really enjoying mixing up the colours and watching the pile of squares grow. You will notice that I haven’t used any orange, yellow or gold yet. 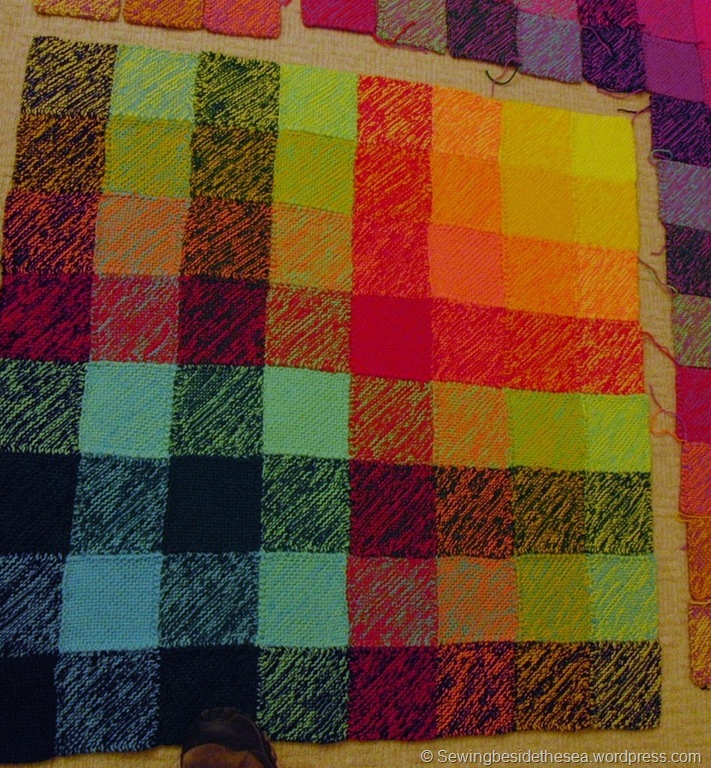 Hopefully, when I do get around to knitting those colours they will make the whole thing zing That’s the plan anyway. I’ve no idea which colours are used in the original. I didn’t even look because I already had these colours and wasn’t looking to buy more. Hopefully, you’ve been having fun crafting too!